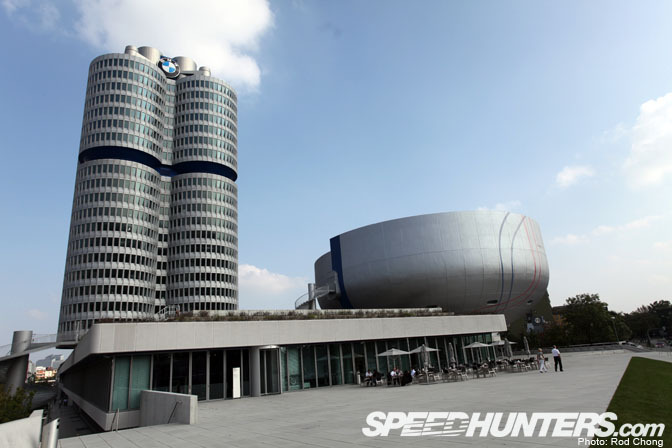 When we were planning out BMW month on Speedhunters, we just knew that we had to visit their home base in Munich, Germany. September just wouldn't be complete without it. If we are truly exploring the culture of BMW, then we have to plug right in to the source don't we? 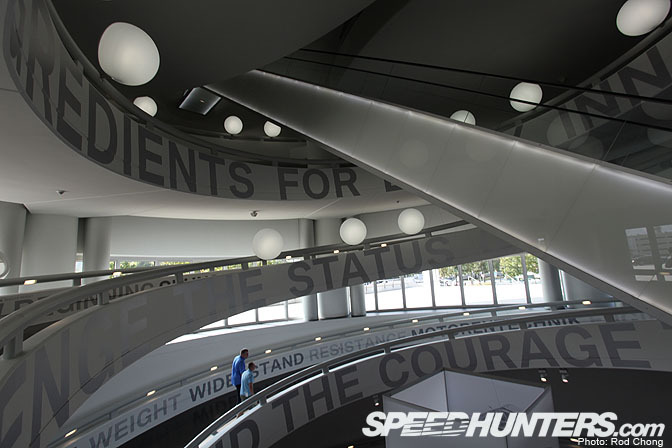 So we worked with our contacts at BMW to get permission to shoot at their two Munich public attractions, BMW Welt and the recently refurbished BMW Museum. 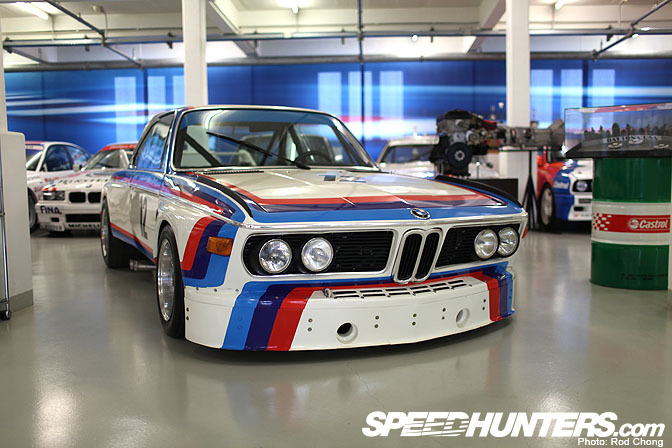 A few people also mentioned to me BMW had a private collection of vintage and race cars in a warehouse somewhere in the city called the BMW Group Classic… And after several months of conversations and planning we also managed to gain access to this very exclusive building too. But let's do this story in chronological order so you can see how the past 2 days in Munich have unfolded for Dino and I. When you arrive into Munich airport on a domestic flight and go to collect your baggage you'll see this giant BMW grill loaming over you. 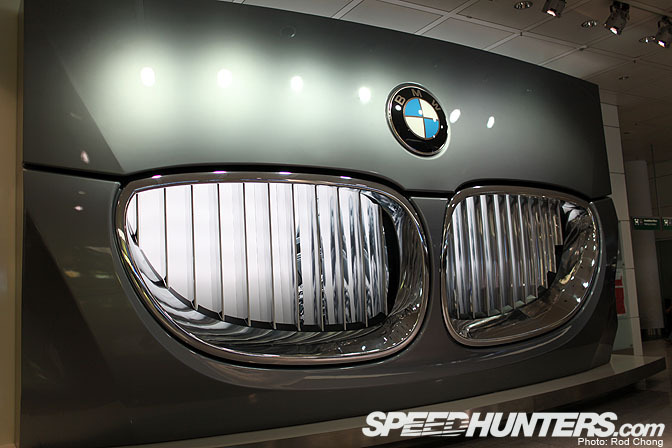 It's a strong reminder that Munich is definitely BMW town! 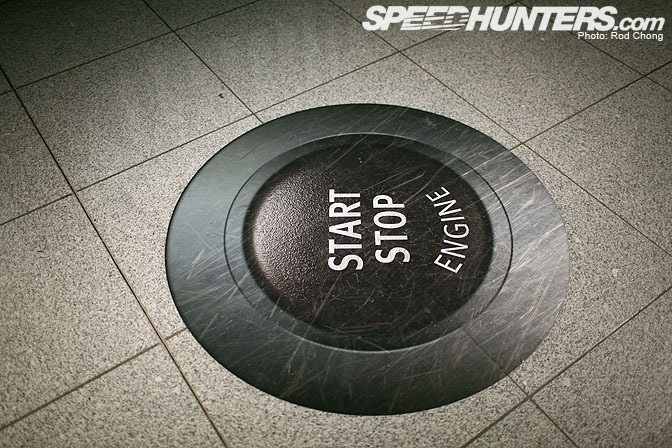 In front of the grill is this engine "Start/Stop" button…. step on it and the display lights up and makes all sorts of engine revving sounds… it was funny to watch innocent bystanders get distracted by the noise haha. 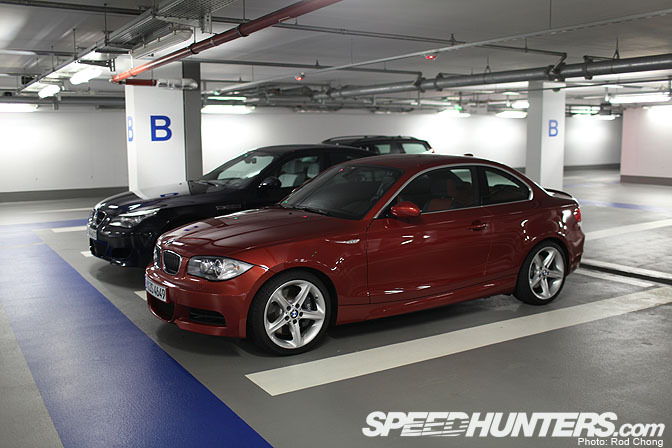 Our next step was to pick up these two press cars BMW has loaned us during our 3 days in Munich… a 135i Coupe and an M5. I'm absolutely in love with the 135… it has crazy amounts of torque and power for such a little car -a real blast to zip around town in or hurl down the Autobahn in. 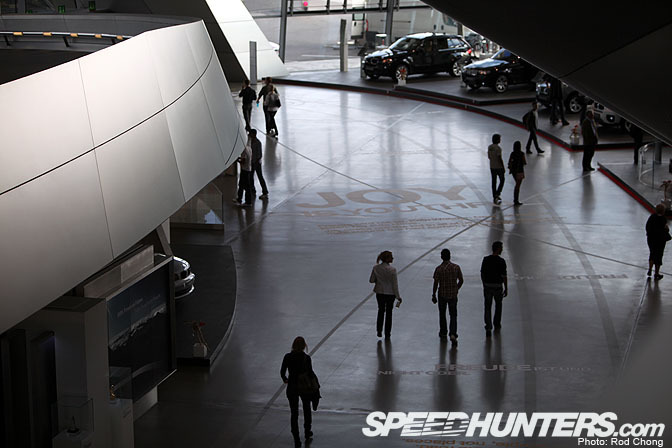 This shot was taken in the underground parking lot of BMW Welt. 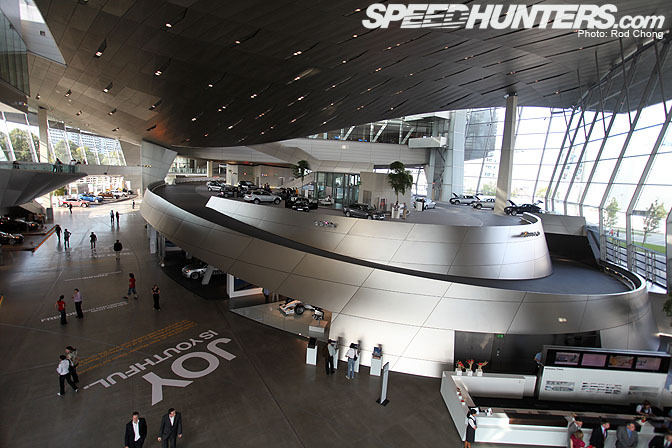 … Welt is German for "World" and is a huge BMW themed, airport hanger sized pavilion of sorts. 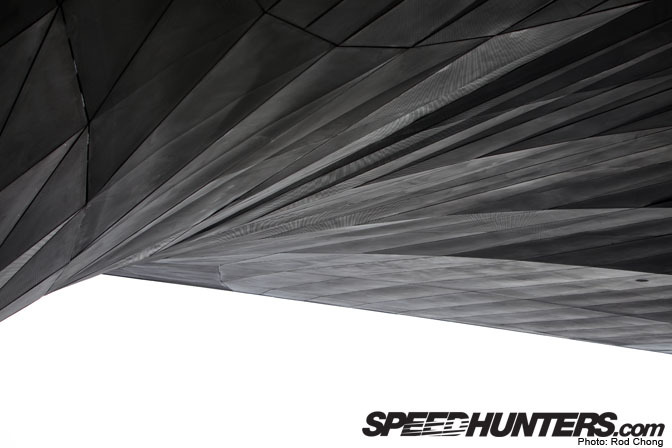 It's an incredible feat of architecture and engineering, as the roof seems to float above a seemingly limitless open volume of space. The raised area on the right is where BMW customers pick up new cars and have a full BMW Brand Experience. This can take up to 7 hours and include factory and museum tours as well as a spot of lunch or dinner. 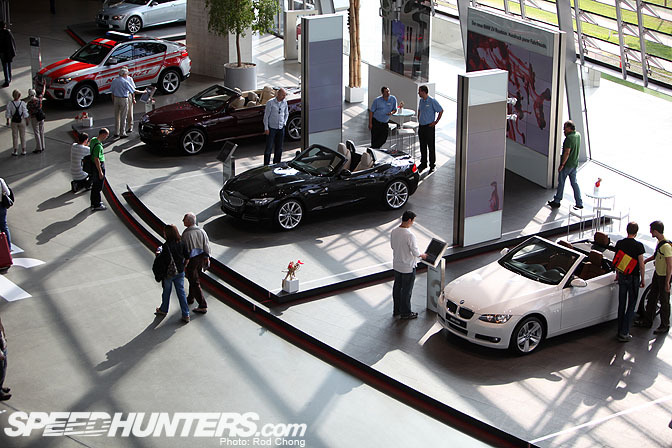 BMW Welt also acts as a showroom for the company's many models. 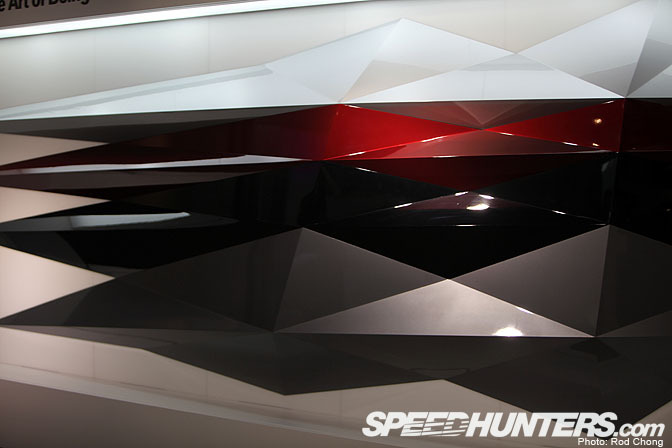 It's possible to spend a day in there playing with all the interactive displays… I just had to marvel at this geomertic polygon abstraction showcasing all the colours available for one of the BMW models. This is forward thinking design at its best. 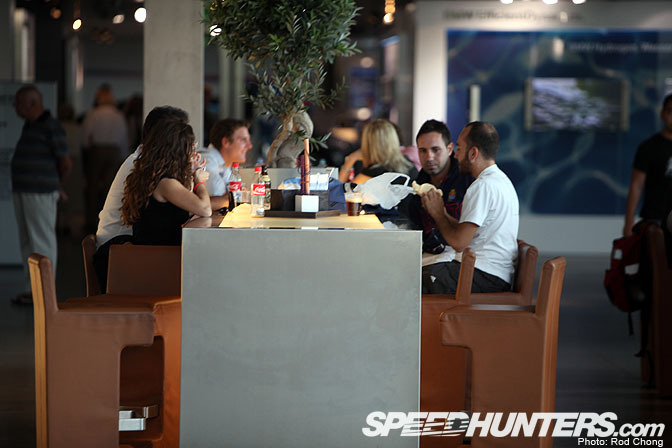 BMW Welt is also littered with cafes, bars and restaurants, most of which seemed to be full and teeming with life. Everywhere you cast your eyes there is a sense of visual dynamics as the velocity of the architecture presses onto you. 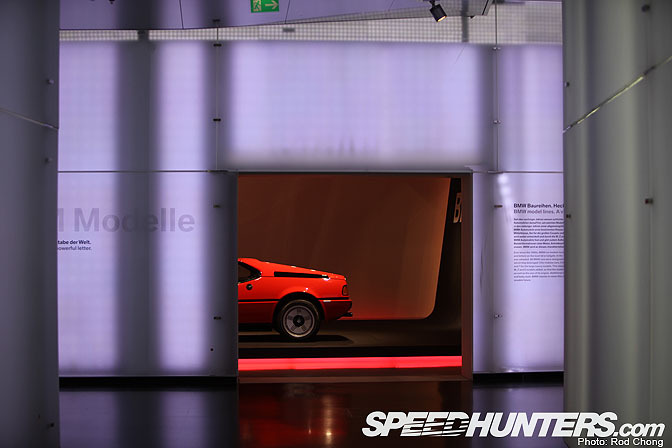 Dino will show you the building in more detail in a future post, but we left the BMW Welt very impressed with our first taste of the BMW-Munich experience. The next morning we were up bright and early for a three and a half hour shoot I had booked at the BMW Group Classic. 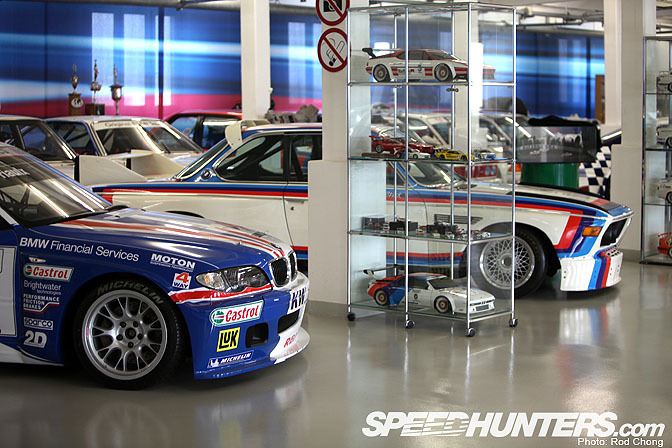 This is a warehouse where BMW's fleet of old race and production cars are kept and serviced. Some of these cars do duty at PR events and shows whereas others are kept just for the purpose of posterity. 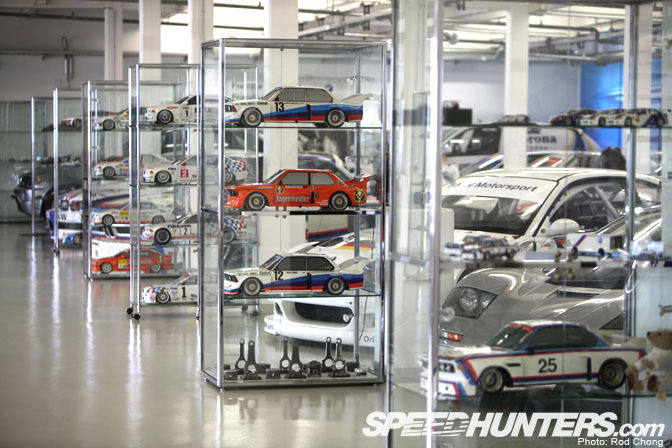 The collection is also home to stacks of BMW related memorabilia and collectables. 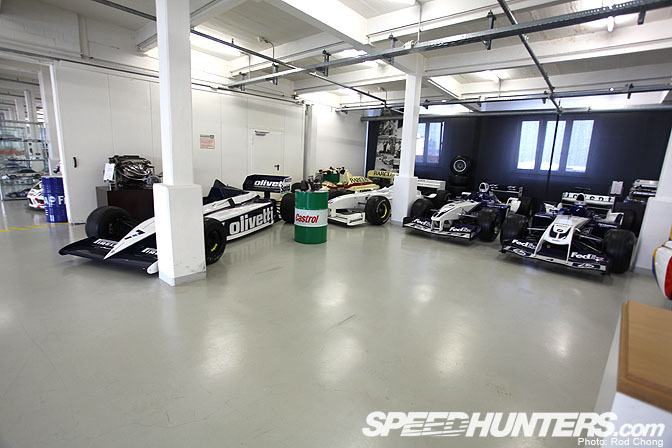 A second room was reserved for Formula One and other open wheel racers. 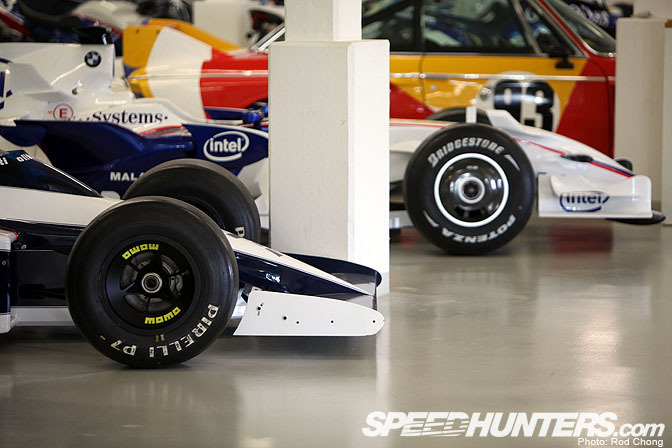 On the left you have a Brabham from the early 1980s while beside it we see last year's BMW Sauber… and in the background is the first ever Art Car. … I'm sure most of you know these cars on site: we see a Brahham, Arrows and three Williams including one of the original test cars. 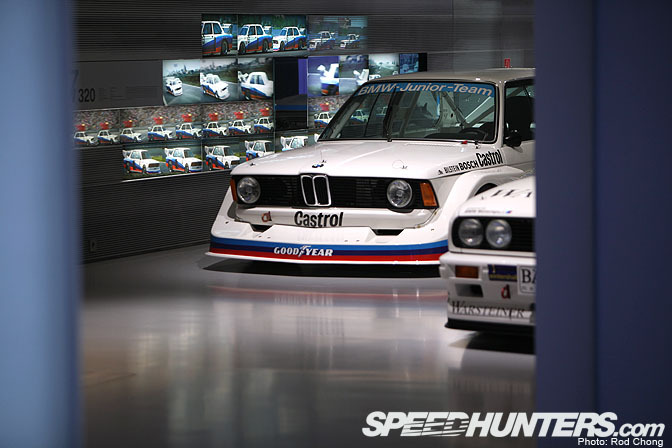 A separate floor houses cars from BMW's production history. 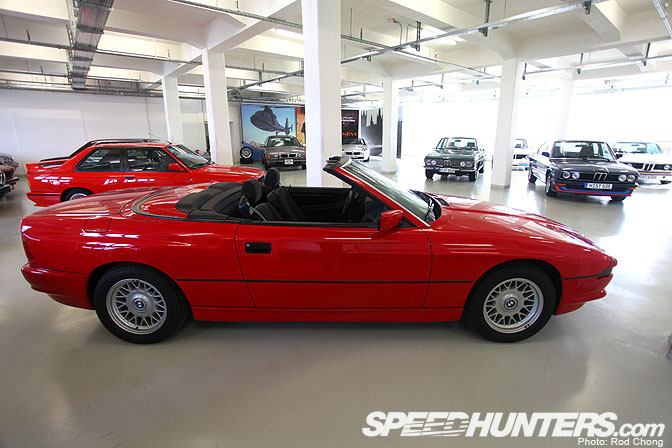 It's also home to some prototypes and preproduction models like this 8 series convertible -a car that was never produced. 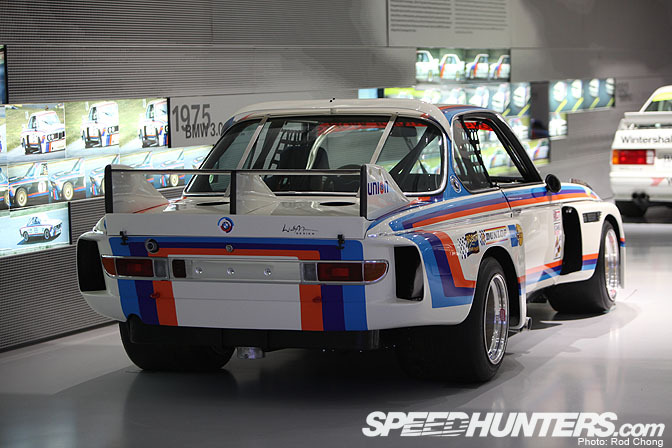 This is the original CSL race car prototype… It was never raced, but formed the basis for all subsequent CSL competition machines. This is one of the M3 GTRs that raced in the American Le Mans series. 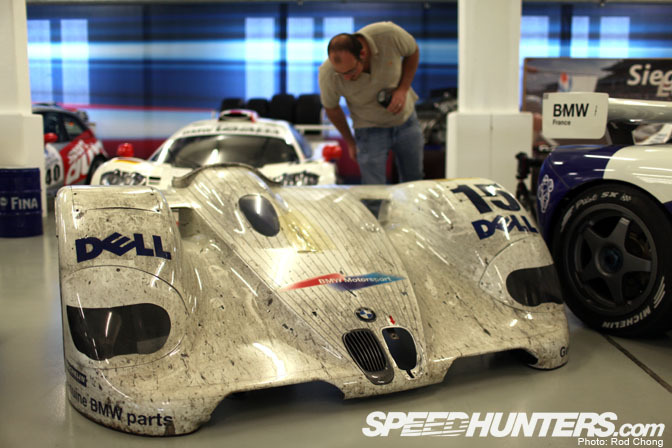 Here Dino is inspecting the front clip from the 1999 Le Mans winning BMW LMR. It's been clear coat finished to make sure the stains from 24 hours of racing are forever preserved. This engine had Dino and my jaws hitting the floor. It's a V16 engine that's been stuffed into a seven series sedan. The idea was to test a powerplant for a proposed high end limo project which never got off the ground. Ahhh… More Group 5 goodness! 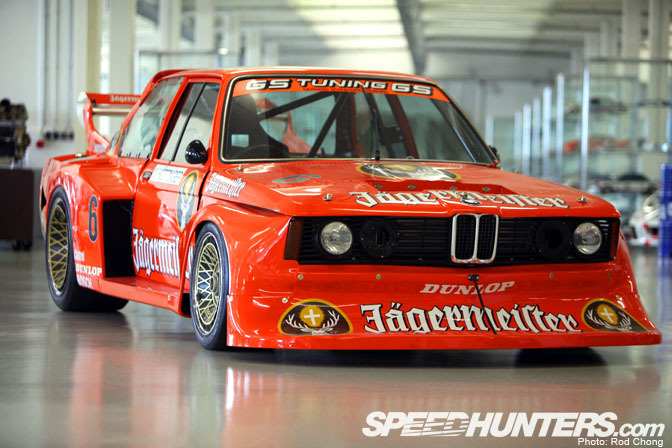 This 1979 spec BMW 320 Turbo looks just stunning with its Jagermeister livery. I'll show you more detailed photos about this car soon. One of the 1977 Junior Team cars was also there too… I swear that someone needs to build a street replica of this car. BMW let us shoot three cars from the collection with some detail. We arrived thinking we'd shoot an E30 DTM car, a M1 and a Brabham F1 car, but once we arrived the plan changed. 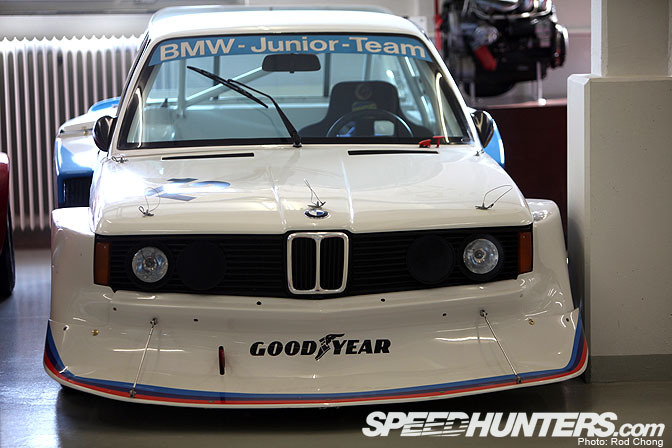 We went with the Jagermeister 320i, a 2008 Sauber F1 car and this machine: an original, perfectly preserved CSL. 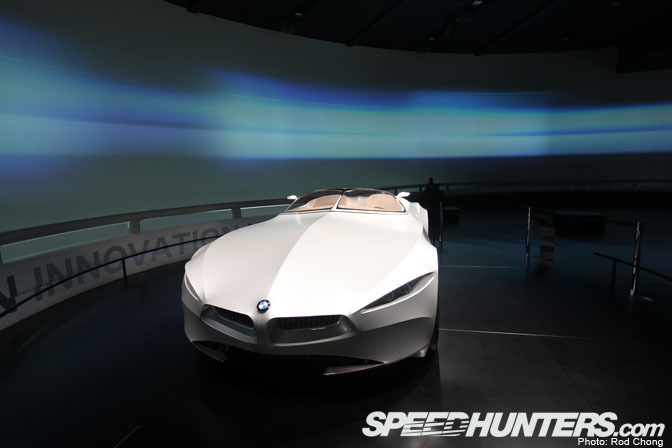 Dino and I then drove over to BMW HQ for our next appointment: a tour of their newly rebuilt BMW Museum. As you can see from the photo, it's connected to the main (cira1972) BMW office tower. Dino is going to write a full report on the museum, but I thought I'd show you a few teasers. 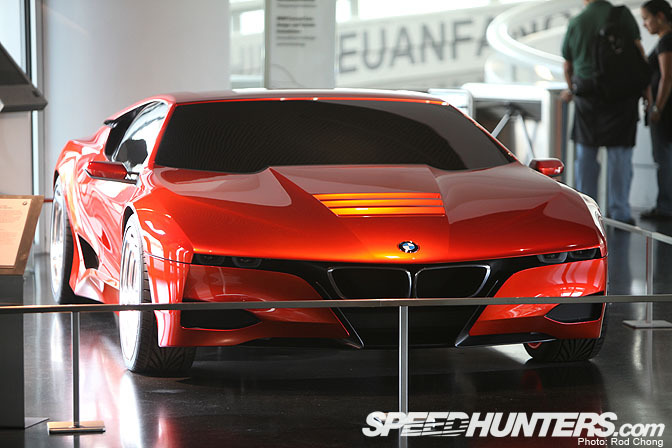 As you walk up to the main ticket area this is what you see: the M1 Homage concept study. What an amazing design! Parts of the museum date back to 1972 although the whole building received a fresh up last year. I'm not sure what they changed in the older part of the building, but it looks unbelievably modern. Everywhere you look the eye is draw through an interplay of line, motion and concept. As you walk up these ramps you can read about the history of the company in these little orbs. 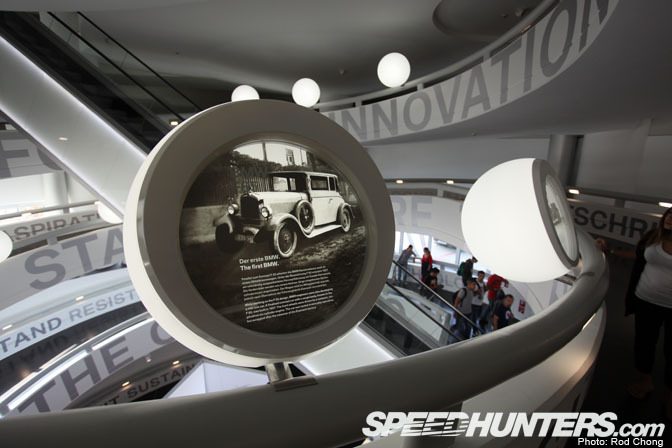 At the top of the spiral is this 360 degree audio visual experience surrounding a selection of concept cars. Our guide told us there were 250 speakers in the room which along with the circular projections was truly bedazzling to the senses. We then got to explore the "new" part of the museum. This room is showing the "M" display. I don't know if you can see this, but all the walls in the main museum area are pixel walls. 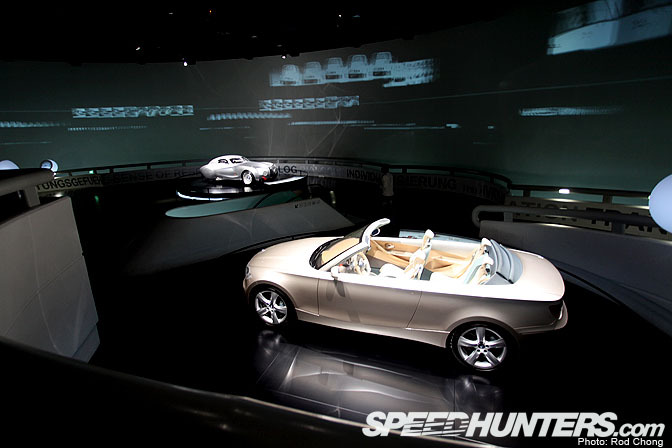 This surrounds the displays (in this case a showcase of roadsters) with moving textures and graphics. I'm not sure we'll really be able to convey this design in a photo-blog format, but we'll see how well Dino does when he writes the story up. Group 5 and more Group 5! Curiously, BMW chose to exhibit one of the American IMSA CSLs that Hurley Haywood raced in the GTO class in 1976 or so. Check out the width of those rear tires! That is architecture at its finest. This is going to be an awesome look into a very iconic brand. I cannot wait! The 507 is one of the most gorgeous cars ever created. Do you have any more pictures of it? The M3 GTR that raced in the American Le Mans series looks a lot like the NFS Most Wanted M3 poster car or is it the other way around? Can't wait to get myself an E36:D Trouble is that I dunno wich way to go with it... I wanna drift with it, but also use it as a daily driver, I want it to have style and stand out, but yet discreet, want a good stance, but not compromise function.... hard one! the nürurgring (gt-track) and the nordschleife (the track in forza) are about 400km (250 miles) away from münchen. I wanna hear that thing. I'm still waiting for someone to make a straight-7 though. @chris davy the m3 gtr came first then the nfs car. 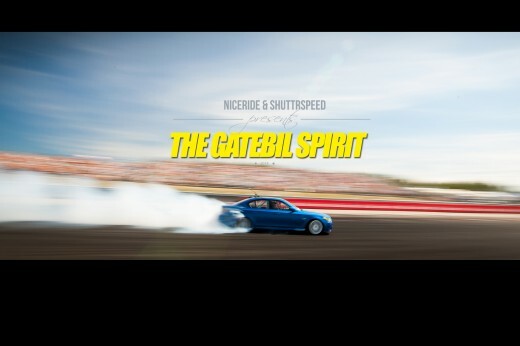 Every posts on Speedhunters should be this caliber. 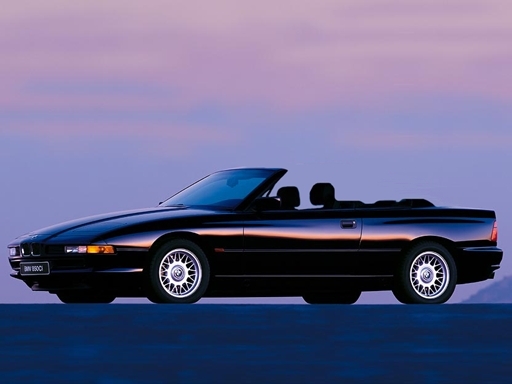 Is the "BMW Group Classic" open to the generall public? would love to spend a day in there! Thank you for that Rod, I'm exceedingly jealous. I cant believe I havent gone there yet.... but now I know. 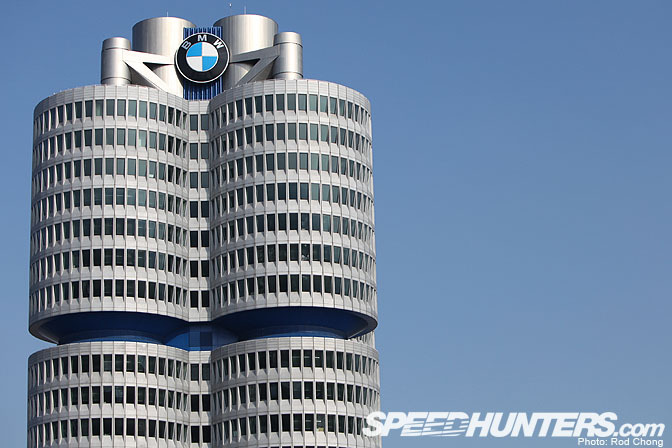 BMW is soo far ahead of its time... there office tower was built in 1972 and looked like that! 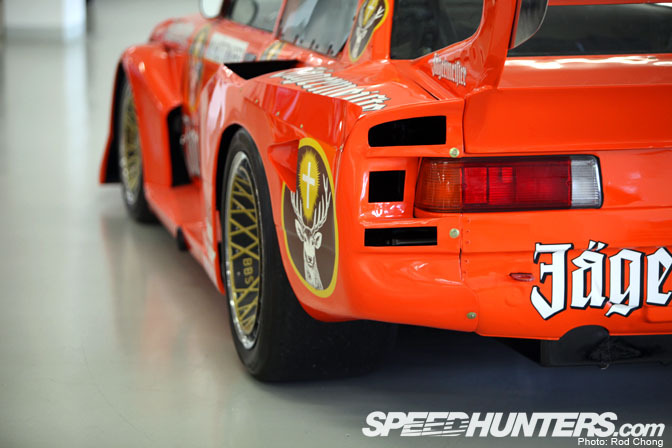 and that Jagermeister Groupe 5.... its stunning even now... so I kant begin to imagine how crazy that must have been back in 79'! 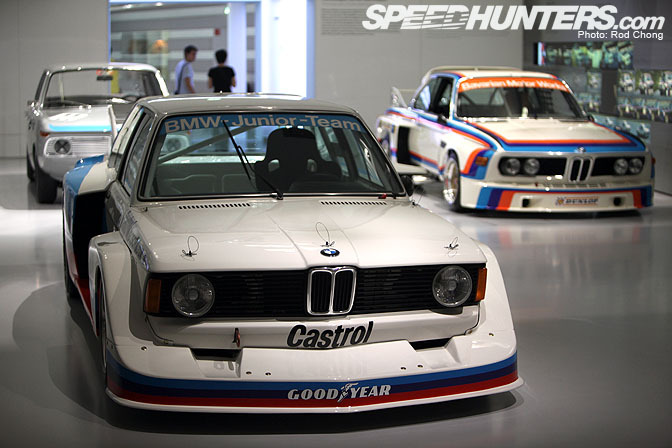 I know BMW Classic isn't just a museum. 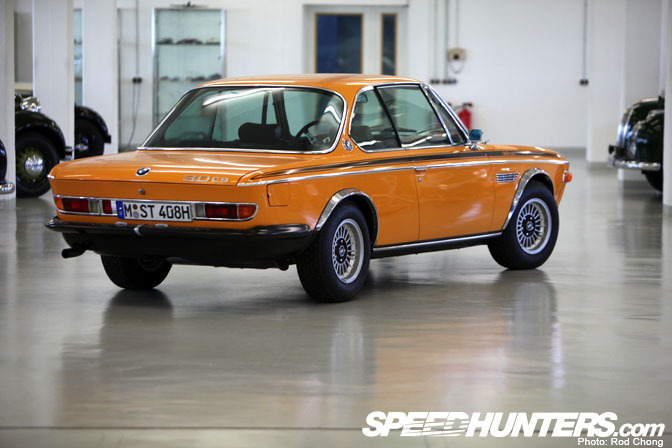 It's a program / resource for owners of classic BMWs. They'll help with parts or information. Used to be called Mobile Tradition I think. I am in love with that 507! Amazing cars, the group 5 cars wow........now thats stance!!! My god guys, an here I was thinking that BMW month couldn't get any better! 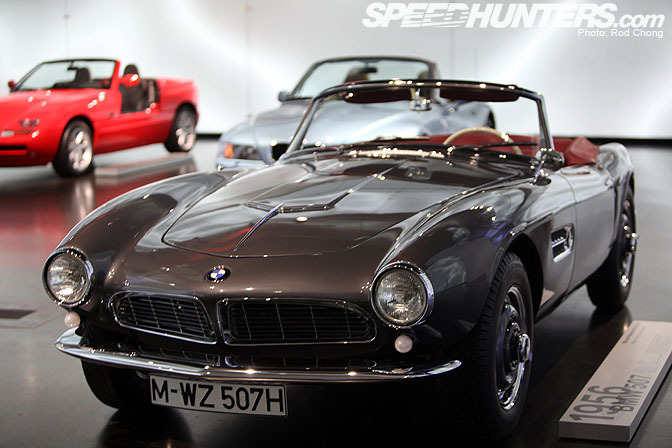 the 507 roadster is just gorgeous! 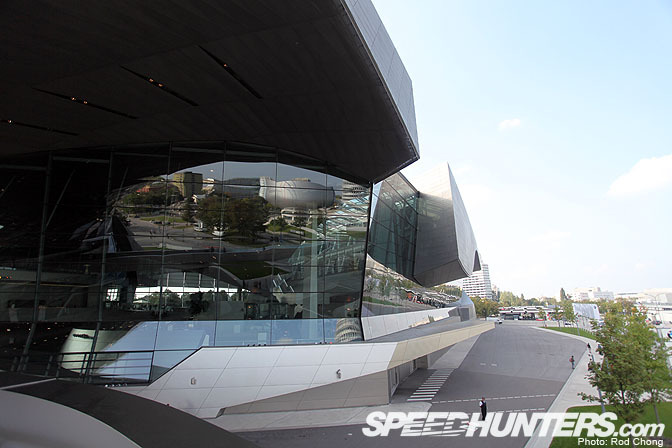 The architecture in BMW Welt looks more interesting than the cars showcased there! 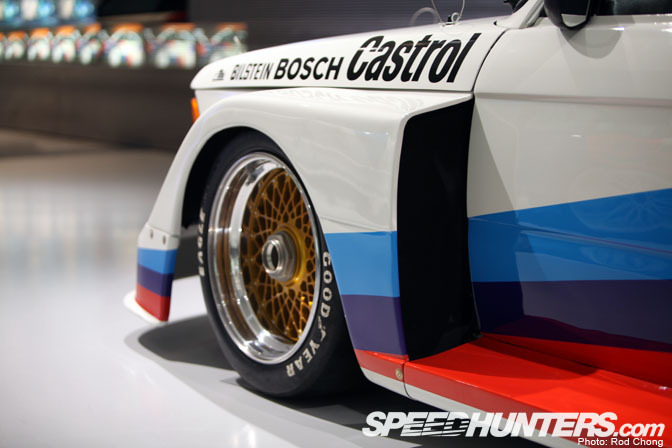 I love the Momo wheels on that Brabham F1, and the meshes on the Jager 3 series, talk about dish! 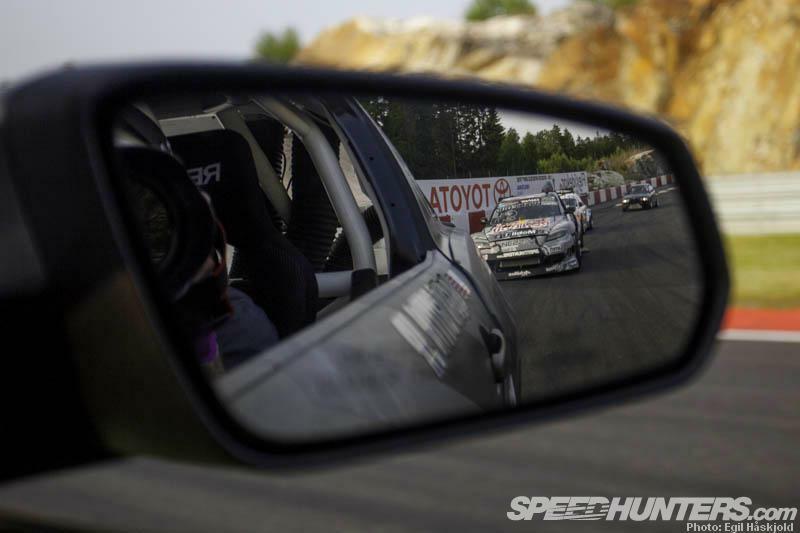 If you look closely at the pics from BMW Classic, there's a McLaren F1 and even an original Mini! Are those hotrods behind the orange CS road car, to the left? !